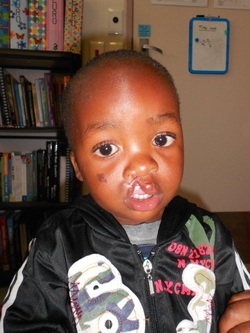 Pumlani was born at Zithulele Hospital in December 2009, with a complete unilateral cleft lip and palate. This is a fairly common congenital condition which not only significantly affects the child's appearance but also causes difficulties with eating and speaking. These difficulties may be overcome through surgical intervention, which should take place as early as possible to reduce the effects on the child's development (particularly in the area of speech-language). Ideally, in cases such as Pumlani's, the cleft lip is repaired at three months of age, and the palate between three and six months of age. Despite attempts to schedule it earlier, Pumlani went to East London for his first lip repair surgery when a little under 12 months old. Unfortunately, infection set in and the repair broke down, adding scar tissue to his already prominent cleft. Although regular attempts to reschedule a procedure were made, circumstances (including striking health-care workers, transport restrictions and uncharged cell-phones) conspired to prevent Pumlani from receiving the necessary surgeries. The result was that at two years old, Pumlani was unable to speak intelligibly and was only able to eat soft foods. In late 2011, the Smiles Train (the Netcare Vodacom Smiles for You Programme) agreed to sponsor Pumlani's surgical procedures but getting to Johannesburg still remained a challenge. Through some generous donations to cover travel, accommodation, food and a translator, together with the dedication of Zithulele's speech therapist, Jabulani were able to make this possible. In January 2012, Pumlani and his mother travelled to Johannesburg to meet the surgical team and complete the first stage of treatment. Following an hour long surgery involving three surgeons, the effects were immediately clear, and even more evident the next day, when Pumlani greeted his visitors with a smile, and began to say 'mama'. Pumlani's stitches were removed a week later and he arrived home to show off his new smile! 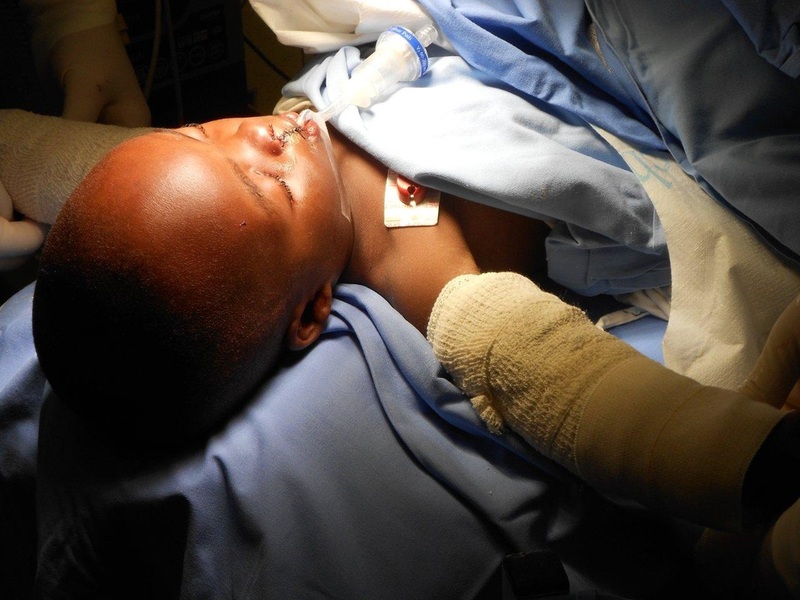 Pumlani on the operating table with cleft lip repaired!